Former Scotland striker Scott Booth has signed a one-year deal with Aberdeen - six years after leaving the club. Booth revealed that he rejected a number of offers in favour of the Dons and is looking forward to playing in Scotland again. "I had the opportunity to go elsewhere," said Booth. "But the lure of coming back to my home town team was just too good to pass over. "Everything has fitted into place nicely as the family were ready to return home and there is no better club for myself, as I know the place so well." 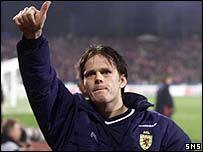 Booth, 31, began his career with the Dons in 1988 and enjoyed nine seasons at Pittodrie before leaving Scotland behind. Top German side Borussia Dortmund snapped up Booth on a free transfer but he failed to make an impact in the Bundesliga. Loan spells with Dutch outfits FC Utrecht and Vitesse Arnhem led to a permanent move to Holland with FC Twente Enschede in 1999. Booth, who made 21 appearances for Scotland - scoring six times, is a free agent and had been linked moves to Hibs and Dundee United earlier this summer. Booth has not played for his country in almost two years but the striker hopes he can pull on the dark blue jersey once again. He said: "I still have ambitions to play for Scotland and I am now putting myself back in the shop window. "However, it has been a while since I have been involved with the national set-up and first and foremost I want to do well for Aberdeen."